While at the pet-fish industry's largest trade show in Nurnberg, Germany (the biannual InterZoo) recently I was reminded of the relative interest and "worth" of currencies while viewing a very large exhibit containing most all species of Sailfin (Zebrasoma) Tangs. While I was commenting to my friends/fellow travelers re the beauty of the Purple Tangs on display, another fellow (from Europe) was most impressed with... the Yellow Tangs! Yes, turns out that Purple Tangs are one of the least expensive fishes in western Europe, whereas Flavescens Tangs command a big price. Despite it's sometimes big price tag Z. xanthurum is a perennial favorite of fish-only marine to reef aquarists in the New World. It's hardy, beautiful, generally easygoing (more on this below), and typically readily accepts all types of foods with gusto. The few downsides for this species involve a penchant for developing "environmental" and nutritional diseases like HLLE (Head and Lateral Line Erosion). With adequate provision for set-up, feeding and maintenance, these are easily avoided, even cured. Endemic to the Red Sea southward to the Arabian Sea about Oman. Reported to nearly nine inches in length. Most about half that in maximum size in captivity. Zebrasoma xanthurum (Blyth 1852), the Yellowtail or Purple (though more blue than violet) Sailfin Tang. Collected from the Indian Ocean and Red Sea, this is a supreme aquarium fish. Hardy and gorgeously bluish purple with yellow pectoral and caudal fin highlights. A 2 inch juvenile and adult couple in the Red Sea and an exemplary aquarium specimen shown. Below: Aquarium specimen and a single and pair of Purples at home in the Red Sea. As with most species of the Tang family Acanthuridae, Purple Tang specimens should be graded/sorted by three general criteria: Their 1) Index of fitness, 2) Behavior, 3) Color. 1) Healthy specimens are full-bodied, in particular in the head area above the eyes should not have a pinched-in appearance. There is an extended time period from collection, holding, transport to wholesale transhippers over and through stateside. This can take a few to several days to a few weeks. If watching tangs in the wild teaches you anything, it is that they feed continuously. When deprived of grazing Surgeonfishes fade to thinness and pale color, at some point giving up on feeding altogether. Seek and pick out ones that have a convex appearance when viewed head-on. 2) Behavior is very telling with Surgeons. Healthy Tangs are curious about their surroundings. Buy ones that are checking you and their tank out; never ones skulking in corners, otherwise "spaced-out". (3) Color wise Purple Tangs of good health and behavioral adjustment are very purple with extremely deep yellow tail fins. Be wary of ones that lack radiance here. Related to poor color and quality in general are degrees of "open pores" on this species head and body associated with their lateralis system. This is manifestation of HLLE, and unless you intend to nurse such animals back to health, is best avoided by not buying them in the first place. This being stated, it has become easier and faster to do just this with improvements in water quality and nutritional quality of prepared fish foods. Mud and algal filtration and high quality foods like Pablo Tepoot's "Spectrum" line are exemplary in this regard. Purple tangs inhabit rocky and coral-rich reef areas where they forage and can duck under cover for sleep and safety. You should provide similar habitat for your aquatic charges sense of place. Concerning inclusion of this tang in 'reef tanks'; I do suggest it. This fish will nibble away at pesky undesirable algae, as well as many filamentous forms. Purple Tangs have however been noted to nibble on some large polyp stony corals (notably Trachyphyllia and Catalaphyllia spp.)... as usual, starting them small, keeping an eye on your fishes' behavior are predeterminates of good aquarium husbandry. Should be in a word, brisk! These fishes live in high motion waters with near saturation oxygen. Surgeons eat & defecate large quantities yet are intolerant of waste build-up. Adequate filtration coupled with frequent partial water changes are requisite. 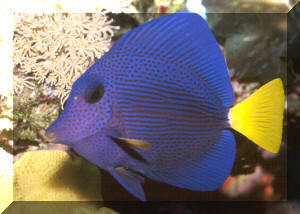 Purple Tangs are almost always fine tankmates as juveniles (under 3 inches in length). Often, growing up in under-crowded circumstances with other fishes, they grow to be the same as larger adults. As is often stated as a rule of thumb, this Surgeonfish is better not stocked with similar-appearing fishes, especially other acanthurids that occupy a similar niche. Those in the genus Zebrasoma especially. Under crowding is always the safest bet, followed by introduction of smaller individuals first; and more aggressive species like Purple Tangs as the last fishes to be placed. But there is no sure-bet with stocking this species. Careful observation is a hallmark of a successful aquarist. The acanthus or thorny spine on Tangs' caudal peduncles is a formidable weapon, which they can and will unsheathe and use. Mainly for show, Purple Tangs are capable of cutting up newcomers they consider a threat, have no doubt. All Tangs are herbivorous to a degree. Observing Purple tangs in the wild and aquariums, and examining their stomach contents has shown that they ingest principally micro-algae, secondarily macro-algae, and that the bulk of the rest is material (associated invertebrates, fish eggs) taken incidental to these. In captivity surgeons require regular offerings of 'greens'. Vegetable flake, pellet and frozen prepared foods are to be had in pet fish stores; better and cheaper are dried and fresh algae from the oriental sections of human food stores. The very best opportunity is to provide some live material that your tangs can nibble on at their leisure. Though others endorse their use, I am very unimpressed with the results of feeding lettuces, boiled, frozen or fricasseed to Surgeons. Be leery of relying on terrestrial plants for marine fish nutrition. Purple Tangs are not as readily susceptible to the common protozoan infections of other Surgeon fishes, and can happily be easily treated by common methods. HLLE is a common, developmental disorder of the species, as has been mentioned, showing the effects of diminished water quality and/or malnutrition by erosive hole in the head, lateral line "disease, going off-feeding... indicative of low pH, high organics, Vitamin C, D, iodine deficiency. Appropriate set-up, water change, proper foods all prevent this. As with almost all species of marine fishes, quarantine of Zebrasoma and other Tang species should be standard operation procedure. By pH-adjusted freshwater dip/bathing and keeping new specimens in a separate system, all parasitic disease can be avoided in your main/display systems. Other than a tendency to become testy with their tankmates with growth and disposition for developing HLLE, Zebrasoma xanthurum ranks high as a species of use for reef and general marine aquariums. Do start with smaller species (three inches in diameter or less) and if possible, make your Purple Tang your last fish introduced to the system. Keep up water quality, provide a varied, supplemented diet and you will be richly rewarded with a hardy, startlingly colored specimen. Fenner, Robert. 2000. Surgeons, tangs, and Doctorfishes, family Acanthuridae. FAMA 12/00. Fenner, Robert. 2001. Fische mit skalpell; teil 3 (Schluss): Seebader der gattung Zebrasoma und der palletten-doktorfisch, Paracanthurus hepatus. Das Aquarium Nr. 381, Marz, 01. Randall, John E. 1983. Red Sea Reef Fishes. Immel Publishing, London.192pp.